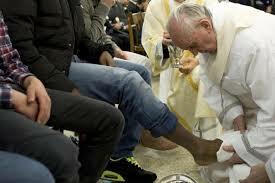 Pope Francis’ Homily on Holy Thursday 2013- the call of a priest. 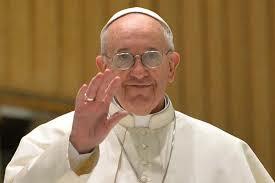 Later on Holy Thursday, Pope Francis washes the feet of young people in a detention centre: he washed the feet of women and of Muslims also. God resplendent in his people, alive and strengthened, we turn to a consideration of activity, action. The precious oil which anoints the head of Aaron does more than simply lend fragrance to his person; it overflows down to “the edges”. The Lord will say this clearly: his anointing is meant for the poor, prisoners and the sick, for those who are sorrowing and alone. The ointment is not intended just to make us fragrant, much less to be kept in a jar, for then it would become rancid … and the heart bitter. downright banal – but only apparently so – the desire of our people to be anointed with fragrant oil, since they know that we have it. To perceive and to sense, even as the Lord sensed the hope-filled anguish of the woman suffering from hemorrhages when she touched the hem of his garment. At that moment, Jesus, surrounded by people on every side, embodies all the beauty of Aaron vested in priestly raiment, with the oil running down upon his robes. It is a hidden beauty, one which shines forth only for those faith-filled eyes of the woman troubled with an issue of blood. But not even the disciples – future priests – see or understand: on the “existential outskirts”, they see only what is on the surface: the crowd pressing in on Jesus from all sides (cf. Lk 8:42). The Lord, on the other hand, feels the power of the divine anointing which runs down to the edge of his cloak. skin and his own heart on the line, he never hears a warm, heartfelt word of thanks. This is precisely the reason why some priests grow dissatisfied, become sad priests, lose heart and become in some sense collectors of antiques or novelties – instead of being shepherds living with “the smell of the sheep”, shepherds in the midst of their flock, fishers of men. True enough, the so-called crisis of priestly identity threatens us all and adds to the broader cultural crisis; but if we can resist its onslaught, we will be able to put out in the name of the Lord and cast our nets. It is not a bad thing that reality itself forces us to “put out into the deep”, where what we are by grace is clearly seen as pure grace, out into the deep of the contemporary world, where the only thing that counts is “unction” – not function – and the nets which overflow with fish are those cast solely in the name of the One in whom we have put our trust: Jesus.